Threat Management Gateway has a full suite of security technologies including; fully featured corporate application firewall, IPS, remote VPN, site-to-site VPN, web caching, proxy, secure applications publishing, web-filtering, anti-virus, anti-spyware, and anti-spamware capability. It is one platform which fits all enterprise security needs, provides business continuity through multiple link management, single sign-on and seamless Active Directory Service integration option. Forefront Threat Management Gateway provides both dial in and site to site remote access connectivity. In addition it acts as a reverse proxy to securely publish internal resources like SharePoint and OWA for external users, as well as protecting company websites from malicious attacks. Forefront Threat Management Gateway provides a robust security solution across multiple-corporate sites. A combination of the TMG Enterprise addition at the main site, and branch editions at the remote sites can all be centrally managed with policies updated for the entire deployment from the main management server. Site-to-site VPN functionality also provides a secure encrypted connection for remote sites. Iron Networks provides a turnkey, single-sku solution for deploying Microsoft Forefront TMG 2010 that is easy to acquire and deploy. The solutions are already sized and scoped for various user counts and tested and validated for TMG 2010 deployments, cutting out a lot of time consuming engineering and testing work normally needed. Iron Networks has optimized the Microsoft Forefront TMG appliance for both security and reliability. 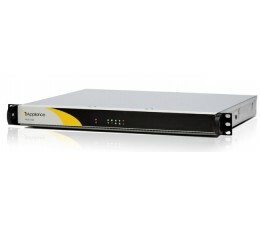 Through creating a custom hardened and image with a reduced attack surface, enterprises can trust the TMGx appliance series meets the most rigorous security standards. Through unified hardware and software support, Iron Networks provides a single throat to choke solution that customers have come to expect from their edge security vendors. Iron Networks knowledgeable support team with years of experience in this technology, makes them an invaluable asset to enterprises deploying TMG 2010, helping them rapidly solve challenges that arise. 1.75" x 17" x 14"
Iron Networks offers three levels of support services depending on the business need and budget. Support services can be purchased in 1, 2, or 3 year increments, and renewed under standard support up to 5 years. Customers seeking longer support for end of life products are able to purchase extended support packages. Support packages include a mix of hardware support, helpdesk support, and appliance updates. The packages are comprehensive and our team of seasoned support representatives provide customers with a single-throat to choke for their complex security and remote access needs. Hardware replacement and 8x5 helpdesk support. Advanced hardware replacement and 24x7 helpdesk support. Iron Networks offers deployment and consulting services to ensure that the advanced remote access appliances are deployed correctly and efficiently for every type of scenario. These include basic rack and stack deployment services and appliance configuration, architecture consulting, and advanced customization work. Although Microsoft has officially announced that TMG is end of life, mainstream support continues until the end of 2015, with extended support until the end of 2020. Iron Networks, as a Microsoft Embedded partner, continues to actively sell and support the nTMG series and has not announced an EOL date on the appliances. Iron Networks will continue to support its TMG 2010 based appliances until Microsoft extended support expires. Any appliance end of life for new acquisition will come with a 12 month notice.